40th anniversary reissue to tie in with the band’s ‘40 Years of The Crack’ tour – 2019. 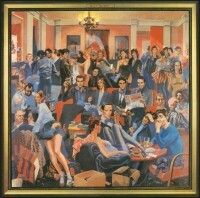 The band’s debut album, released in 1979, The Crack contains the UK hit singles: Babylon’s Burning and Something That I Said. Very much fitting the era’s protest atmosphere – the white-reggae of Jah War, which was written in the aftermath of the Southall unrest and the over-use of force by the Metropolitan Police’s Special Patrol Group in the ‘70s, was also released as a single. Hard-hitting song S.U.S also deals with similar issues – a withering comment on the notorious stop and search laws. The album is both anthemic, with simmering roots reggae and dub, but seared by classic rock guitar leads, totally redefining the genre and combining to create an ominous atmosphere of paranoia and dread reflective of the times in which it was made. Re-mastered by Tim Turan at Turan Audio. Cut to vinyl at Abbey Road Studios.